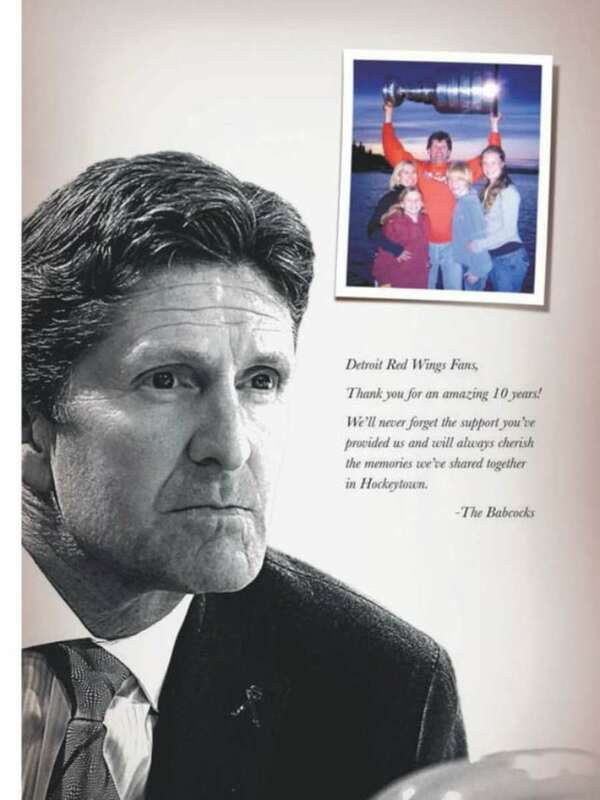 Mike Babcock took out a full page advertisement in Friday Detroit Free Press to thank fans of the Red Wings for their support of him and his family over the past 10 seasons in Hockeytown. The ad also features Babcock hoisting the Stanley Cup. Thursday afternoon, Mike Babcock was officially introduced to Toronto media as the new coach of the Maple Leafs. Friday morning, Red Wings fans in Detroit woke up to a full-page advertisement in the Detroit Free Press from their former coach, thanking them for all the cheers. Babcock, who coached the Red Wings to 10 consecutive post-season appearances, two straight appearances in the Stanley Cup finals and one Stanley Cup victory, used the advertisement to give thanks to thanks for the support he and his family have received over their decade in Hockeytown and as one final goodbye to the fans they have grown to love during Babcock’s 10 years in Detroit. (Image via Detroit Free Press) The full text of the ad reads: “Detroit Red Wings Fans, Thank you for an amazing 10 years! We’ll never forget the support you’ve provided us and will always cherish the memories we’ve shared together in Hockeytown. – The Babcocks” In the top right corner of the ad is Babcock, along with his family, as he hoists the Stanley Cup during his day with the trophy following the Red Wings 2007-08 championship season. While Detroit Red Wings fans likely didn’t picture their long-time coach leaving via free agency to a division rival on an eight-year, $50 million contract, thanking the fans is a great move by Babcock and should at least do something to win back some of those who are sour over his decision to head to Toronto.